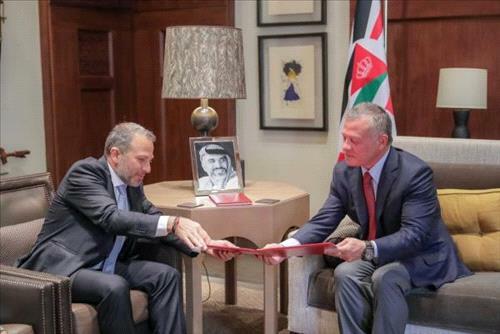 AMMONNEWS - His Majesty King Abdullah II Tuesday received Lebanese Foreign Minister and Presidential Envoy, Gebran Bassil, who handed the King an invitation from President Michel Aoun for the Arab Economic and Social Development Summit, slated to be held in Beirut in January. During a meeting at Al Husseiniyeh Palace, King Abdullah and the Lebanese minister also underlined the brotherly relations between the two countries, and emphasized the need to further sustain coordination and consultation on various issues of common concern. The meeting, moreover, touched on the importance of combined efforts in light of Middle East challenges, especially those related to the Palestinian issue and the peacemaking process between the Palestinians and Israelis, on the basis of the two-state solution leading to the establishment of a sovereign Palestinian state on the 1967 borders with East Jerusalem as its capital. Discussions also tackled the crisis in neighboring Syria and the need to explore avenues to realize a political solution in the war-ravaged country, as well as the burdens that both Jordan and Lebanon shoulder due to the Syrian refugee crisis. The King also asked the minister to convey his greetings to Lebanese President Michel Aoun, and expressed his keenness to further consolidate bilateral ties. The meeting was attended by Minister of Foreign and Expatriate Affairs, the King's advisor and the director of his Office as well as the Lebanese Ambassador in Amman.